Georgia enacted a long-term care insurance regulation on October 1, 2008. Georgia residents purchasing long-term care insurance after that date are protected by Georgia’s Rate Stability Regulation*. The regulation has helped curb long-term care insurance rate increases in Georgia because it forces long-term care insurance companies to lower their profits if they seek a rate increase. Of the 13 companies selling long-term care insurance in Georgia today, 11 of them have NOT had any rate increases on any of the policies they’ve sold in Georgia since the effective date of this regulation (10/1/2008). Approximately 99.7% of the long-term care insurance rate increases in Georgia have been on policies purchased before October 1, 2008. 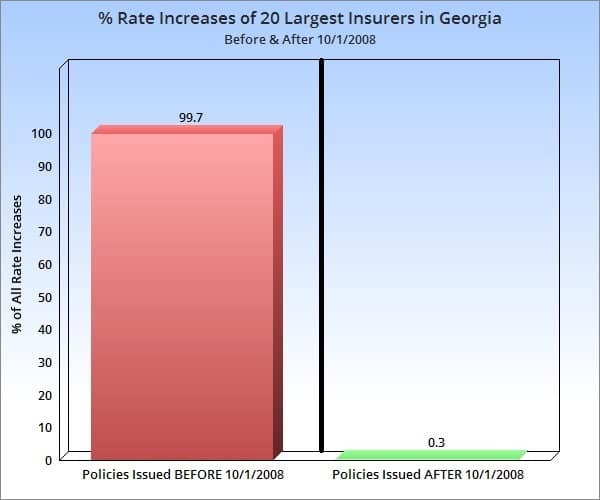 Policies purchased before October 1, 2008 are NOT protected by Georgia’s Rate Stability Regulation. Under the old rules, when a rate increase was requested the insurance company could price normal profit levels into the rate increase. In many cases, a rate increase would result in increased profits for the insurance company. Under the new rules, if an insurance company requests a rate increase they must decrease the profit levels in their pricing to a cap that is pre-determined by the new regulation. This regulation has removed the profit motive from rate increases. Under the old rules, the insurance companies were NOT allowed to include in their pricing any “margin for error”. There was no cushion priced into the policy in the event their claims exceeded their original projections. This resulted in a lot of rate increases. Under the new rules, every insurance company is REQUIRED to include a “cushion” in their pricing–a margin for error. The goal of the “cushion” is to try to avoid the need for any future premium increases. Under the old rules, the insurance companies did NOT have to certify the accuracy of their pricing assumptions. If their assumptions turned out to be wrong, they would just request a rate increase. Under the new rules, the insurance companies are required to have a qualified actuary certify that no premium increases are anticipated over the life of the policy. This is why they are required to include a “margin for error” in their pricing. Not all policies are covered under these new regulations. Although these regulations are working very well in Georgia, these regulations only apply to policies purchased in Georgia after the regulation became effective. These regulations became effective in Georgia on October 1st, 2008. All policies purchased after October 1st, 2008 ARE protected by these regulations. *Many group policies (like the Federal Long-Term Care Insurance Program, CalPERS, and other self-funded groups) do not have to comply with the Rate Stability Regulation. Our focus is to help you get the coverage you want, from a top insurance company, for the lowest possible premium.